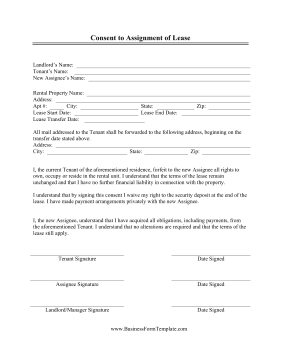 Landlords can use this free, printable consent to assignment of lease contract. Tenants who want to sublet their apartments or rental units to other assignees can fill in this record before transferring rights and rent. I, the current Tenant of the aforementioned residence, forfeit to the new Assignee all rights to own, occupy or reside in the rental unit. I understand that the terms of the lease remain unchanged and that I have no further financial liability in connection with the property. I understand that by signing this consent I waive my right to the security deposit at the end of the lease. I have made payment arrangements privately with the new Assignee. I, the new Assignee, understand that I have acquired all obligations, including payments, from the aforementioned Tenant. I understand that no alterations are required and that the terms of the lease still apply.